This is a dish that will feed a crowd, and people love it. It is easy made in the crock pot and most people love a good taco. I serve both hard shells and soft tortillas, alongside my numerous toppings. This recipe came out of my favorite slow cooker recipe book Fix-It and Forget-It Big Cookbook by Phyllis Pellman Good. *The recipe was spelled this way, I know I am not the best speller but this was not my error. 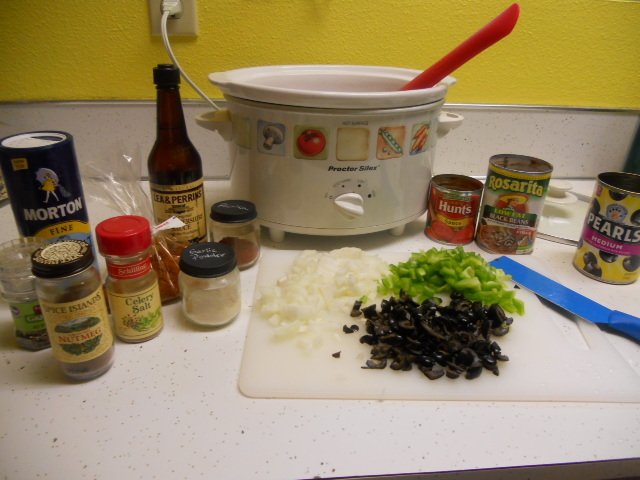 Combine first 15 ingredients in slow cooker. Cover, and cook on high 2 hours. Just before serving, fold in corn chips. Spoon mixture into taco shells. Top with lettuce, tomatoes, and cheese. With any leftover you can make a great taco salad. 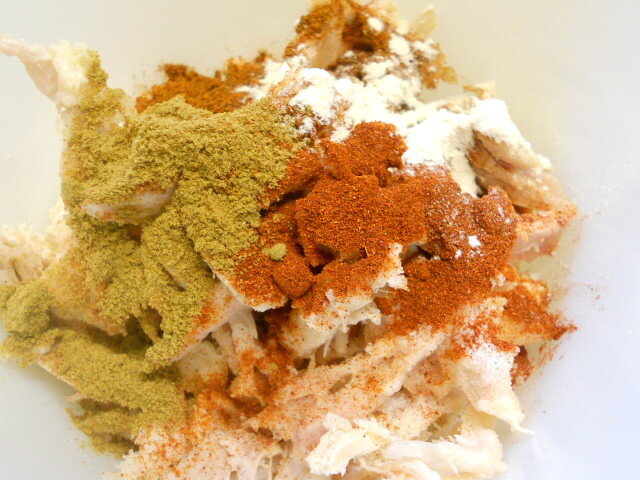 *I make this often with ground turkey, we are not big beef fans. Not only do most people not notice, but it is much healthier. 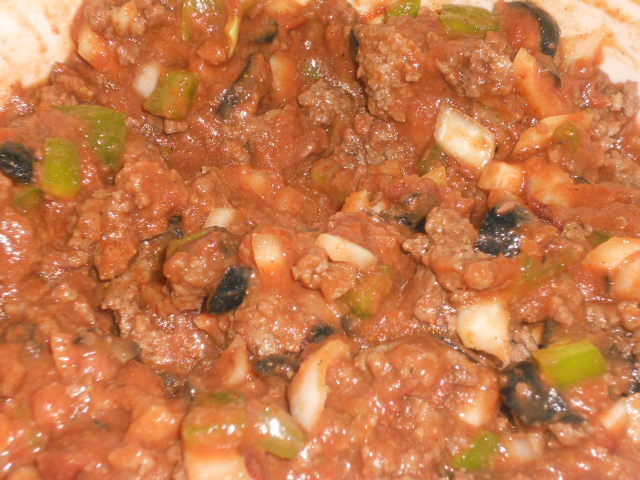 Posted in Crockpot, Meat/Fish, Recipes and tagged COOK, Ground beef, ground turkey, Meat, Refried beans, Slow cooker, Taco, Tortilla, Tortilla chip, Worcestershire. Bookmark the permalink. Mr.Picky is out-of-town weekly driving truck. In order for us to save money and eat healthy we pack his food for the four days he is gone. This is probably no different to those of you who make ahead breakfasts and lunches for the week in order to help stick to a healthy lifestyle. Planning ahead and preparing food is something that helps my days run smoothly. 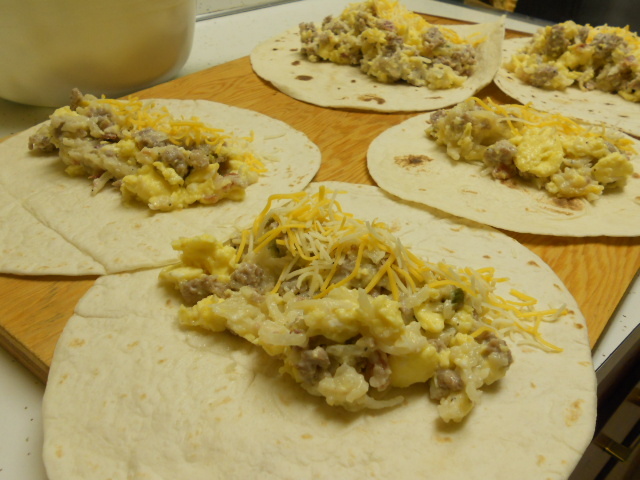 Breakfast burritos is a go to for our whole family. Mr.Picky loves anything in a tortilla, and I can often add vegetables to my filling and no one complains. I will take burrito filling and tortillas on trips and we can pretty much heat them up anywhere. Mr.Picky likes to take burritos wrapped and made, so he just has to heat and go in the morning. These burritos will last a good four days in the fridge made up, and even longer if you keep your filling and wraps separate. The burrito filling can make as much or as little as you would like. Add your favorites, and leave out what you don’t like. My instructions are general and I am only listing things that I have put into my burritos on different occasions. Add as much or as little as you would like. In general I will pick a meat or two, potatoes, eggs, gravy, and a few vegetables. The one thing I think that makes a difference is some country gravy mixed in so the filling is not dry. I mix my filling besides the shredded cheese together in a large bowl. Scoop filling into tortillas and add cheese if you would like. Roll up and wrap burritos or keep separate and prepare as you go. Posted in Breakfast, Recipes and tagged Bacon, Bell pepper, Breakfast, breakfast burritos, Breakfast sausage, Burrito, COOK, Home, Tortilla. Bookmark the permalink. Looking back I don’t ever remember eating enchiladas, instead my mom always make a casserole with similar flavors. When I met my husband his mother was always making enchiladas, with flour tortillas and a verde sauce which I had never tried before. She usually uses a ground beef filling, but it was her sauce that won me over. She showed me her secret which is so simple. This recipe was given to her from an acquaintance thirty some years ago. 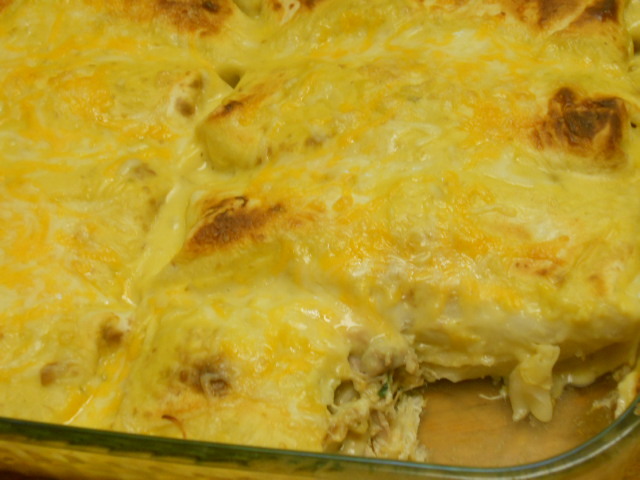 I use the verde sauce recipe but choose to put a chicken filling in my enchiladas. The filling changes every time I make enchiladas because it usually consists of what I have on hand. Feel free to subtract, add, or substitute your filling; but I would try the sauce as it is. For the sauce place chicken soup, and milk in a medium saucepan over medium heat. Whisk until smooth, and add the salsa verde to a level of spice that you can handle. I usually use about a 1/2 a can to serve to my family. I would start with a 1/4 of a can and taste the sauce as you add the salsa verde. Once your sauce is smooth, remove from heat and set aside. For the filling in a large bowl combine all ingredients except the tortillas. Mix until combined and consistant throughout. Like I said, add as much or as little of whatever sounds good to you. This time I sautéed my corn and onions a bit, and added my spinach in just enough to wilt it. I almost always add sour cream and cheese to my chicken filling. My vegetables vary on what is in the house, or what needs to be used up. 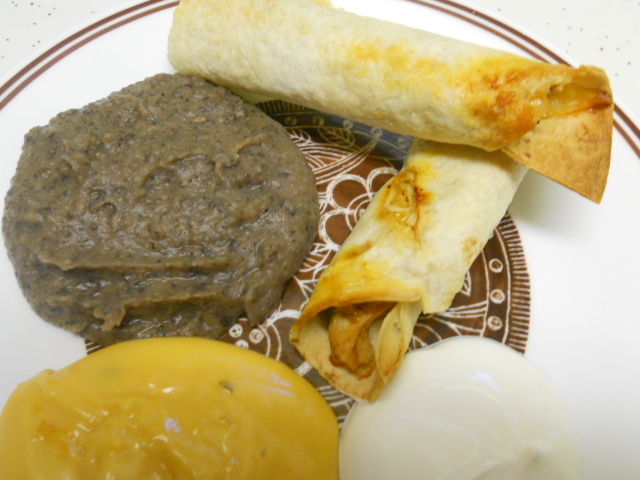 To assemble grease a 9×13″ casserole dish, and spread about 1/2 cup of the sauce on the bottom of pan to prevent sticking of enchiladas. 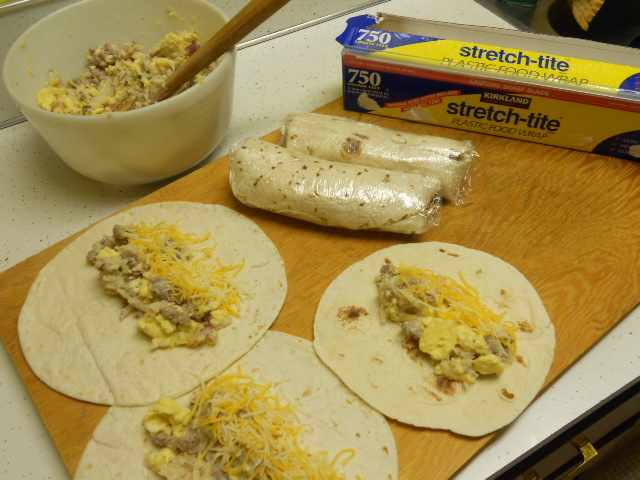 I used about 2/3 of a cup of filling per 6″ tortilla and rolled them up, placing seam side down in my casserole dish. Fit them any which way you can, it worked for me to put two rows of four enchiladas across my pan. Pour the remaining bit of sauce all over the enchiladas, taking care to cover every bit of tortilla with some sauce so the tortilla does not dry out. Bake at 350 degrees, for about 25 minutes or until bubbly and starting to brown. Add 1/4 cup more of shredded cheese to the top the last 5 min. of baking if you would like. 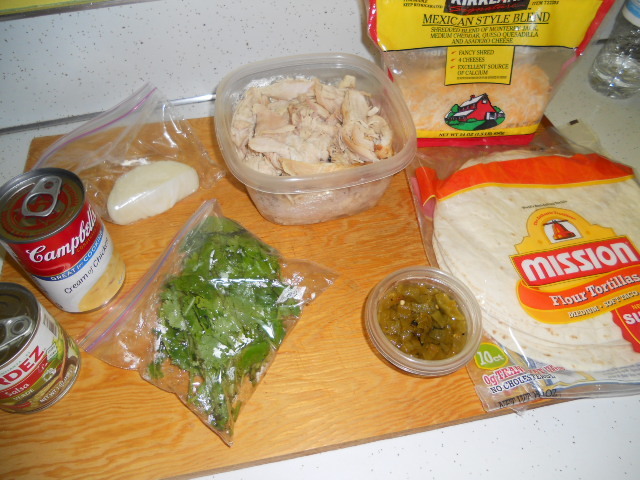 Posted in One Dish Meals, Recipes and tagged Casserole, Cheese, Enchilada, Green sauce, Sauce, Sour cream, Spinach, Tortilla. Bookmark the permalink. This is a great dish, whether you like spinach or not. Both Mr.Picky and my 4-year-old love these flautas, spinach and all. The filling can easily made a day or two ahead and then roll and bake before you are ready to eat. I usually just eat mine with sour cream or plain. On this night this picture was taken we had nacho cheese and homemade refried beans to dip along with tortilla chips for dinner. I know not so healthy but we all need a little bit of yummy in our lives. Brush the flautas with olive oil or spray with cooking spray. Bake for 10 minutes, then turn them over and bake for until 10 minutes, or until crispy. Posted in Appetizers, One Dish Meals, Recipes and tagged Chili powder, Spinach, Taquito, Tortilla. Bookmark the permalink.